Just for the hell of it, since it seems like what the cool and hip people are doing, I downloaded Twine. And I have created a Twine “port” of City at the Top of the World. No, you can’t play it yet, because I don’t have anywhere to put it right now and free wordpress doesn’t let you upload html files. You can play it here, but because of the upload type they use, you don’t get the full Twine experience of white text/black background/title frame on the left. It took me a little under an hour, and I kinda half-assed some stuff (I didn’t fix hyphenations, for instance), and I’ve gotta say: I don’t think this qualifies as “Game Development”. I feel like I did more coding when I manually built City in MS Word. I sure don’t feel like I “developed” anything. I mean, I didn’t even HTML. So yeah, I can totally see why people who do actual coding type stuff look down on Twine and don’t consider people who make stuff in it real developers. That said, aside from the fact that it doesn’t export in a format that can be published on dead tree pulp, it’s a pretty nice and fun little program decent for making a choose your own adventure story. I can also see why there is a schism over Twine in Interactive Fiction communities. I guess it depends on how you define interactive; if you define interactive as interacting with the text itself, sure, CYOA is interactive fiction. But by that logic, so is reading a regular book, assuming the invisible cue to turn the page when you’ve finished the page you’re on. If you define interactive as interacting with the environment and the fictional world in the piece, then most Twine games are pretty iffy. Heck, the “game” aspect is kind of iffy, too, since it’s more of a click to the end type thing in a lot of cases. I’m sure that there are ways that you could make something that’s far more “game”-like in Twine than a typical nodular fiction. But why not let it be what it is? A tool for writing branching fiction. Branching Fiction isn’t a game in itself, but it certainly has its own merits, so there’s no reason to bother fighting to get it recognized as such. Whatever. I’m a double dev. Cuz I developed my game in MS Word and then I coded a port in Twine. Now I just gotta get Greenlit on Steam! Or you could just buy the paperback from Lulu. 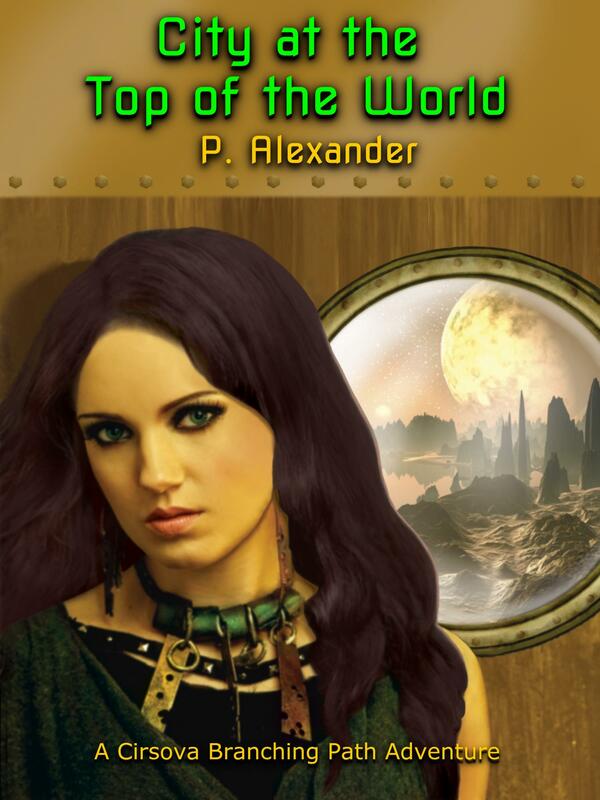 Leave a comment, and I will email you the pdf version of City at the Top of the World. Please make sure that the account you leave your comment with has a valid email address associated with it so I can send you a copy of the book! Please note, a “Like” will not provide me a link to your email address; it must be a comment. This offer is valid until December 21st; you will receive your copy on December 22nd. One exciting thing I did learn, however, is that the Interactive Fiction community is just as wonky and fragmented as the rest of gamerdom. I learned many cool things, in fact. 1) There is a schism in the community about what IF is; there are Parser Purist and there are those who think that any and all text-based stuff counts as IF. 2) Much like some people gripe and complain about games being developed on this engine or that engine, people in the IF community seem to be grumbly about games developed in things besides Inform & TAD(both parser based dev platforms), particularly something called Twine, which sounds like it eats christian babies if some parser-Grognards are to be believed. 3) The debate between parser based games and CYOA/Hyperlinked games is pretty heated and involves some hurt feeling. Some people are going so far as to suggesting 1-starring any entries that aren’t parse based in their competition, while other people are saying that’s incredibly misogynistic and transphobic. Wait, what? Am I missing something here? Oh, right! Niches, niche programming, niche development, learning curves, silenced voices, etc. etc. etc. Unless they’re really well put together (and even then, it can be iffy), parser games are incredibly difficult to play. There’s not only an incredibly steep learning curve to play them, there’s also a steep learning curve to develop ones that aren’t crappy unplayable messes. Choose Your Own Adventure style html based programming has apparently become more popular in the Interactive Fiction community if for no other reason than developing this sort of game is easier and has less learning curve. Hell, I developed my “Game” in MS Word, because after one look at Inform I was all “No time for this right now”. Anyway, accessibility has led to two things: a change in ratio of choice-based interactive fiction vs. parser-based interactive fiction, and an increase in ‘marginalized developers’ who want their voices heard. Pretend I said “marginalized developers” in regular quotes. Then pretend I said it again with finger quotes. Who are marginalized developers? Developers who haven’t learned to develop except in user friendly software. Developers who are LGBT and/or minority. So, there’s the complaint that X is not Y. Indeed X is not Y, but the fact that you are complaining is because you hate gay people and other minorities. Wait, what? Apparently, Zoe Quinn, a figure who interestingly most of the IF community doesn’t seem to have heard of, and #gamergate cast their shadows here, too, because since Zoe’s game was a choice based IF title and Zoe is being persecuted, then your dislike of a certain game type is dislike of Zoe and all marginalized individuals? I don’t know! But maybe! It interests me when I hear about marginalized voices in gaming, and often times these voices become marginalized because they don’t go into development. Now that they are in development using a simple to use dev tool, people who did not like that game style in the first place now do not like gay people/women either because I guess gay people/women are the ones using more? Are LGBT underrepresented in parser-based text gaming? Are they underrepresented to a greater degree than they are overrepresented in other media? Everyone crapped themselves when it came out that most people’s impression of the percentage of LGBT people in America was wildly overestimated. So, is it possible that parser-based gaming is so incredibly niche a development field, and the LGBT dev community so small that a random sampling might just happen to include next to no LGBT devs? I don’t know, nor do I know if it matters. Based on a few of the games I played in IFComp, I can see why some people might complain. A few of the games felt less like games (some didn’t even really have choices that I could perceive) than they did Dorothy Allison prose-poetry where you clicked a hyperlink to go to the next paragraph. Is it interactive fiction? Well, it’s fiction that you can interact with, but I can see how finding multiple examples of that when someone was really hoping for a Zork-fest one might find it aggravating. In the meantime, I’m now facing Stereotype Threat. Why? Because Oh, Crap, I’m a minority, and I’m writing my choice-based Interactive fiction in a word-processor! Is it because I’m Latino? Is it because I have gender dysphoria? Is it because I smoked too much dope in college listened to industrial music? Or is it because that was the platform that I wanted to create in? I don’t blame somebody who wants to play Zork for not wanting to read what I wrote, and I think it has more to do with them wishing it was Zork rather than because I’m whatever niche ethno-gender identity. This is probably bad to say, since I’m so “new” to the Interactive Fiction community, but after one quick peek under the hood, I’m sticking with my D&D homies. But if any of you who came over on the forum sandwich feel like staying, by all means stay, and I hope you enjoy what you find here. *: I won’t tell you which ones I played, but seriously, Creatures Such as We was the only one I liked; what does that say about me, since it was choice-based and not parser, but also not html-links? Too Early to be Talking About a Sequel? Especially since no one has bought the first one yet? * Maybe, but I’ll talk about it anyway. I’m trying something a bit different this time. One of the points some folks made about City was that the nodes were a bit long, especially compared with typical 80s CYOAs, and there weren’t as many choices as they would’ve like to have seen. Well, I’m hoping to remedy this in the followup. This second book will have a good bit more player/reader agency to it, I hope. I’m avoiding overly long nodes, while trying not to sacrifice setting too much. I’m drawing heavily on the Encyclopedia for this. In many ways, this next book is going to be a gamebook style rewrite of the original Cirsova campaign. The difficult part will be trying to follow all the branching paths to their necessary ends. I want to avoid some of the “doubling back” from City at the Top of the World. I could justify it there in part because of the relatively confined space it took place within. This next book, however, will take place all across Gatlia. I want to look at the trade along the Long Road, the banditry, the political system and unrest, pirates, and, of course, the mysterious Polarans. The downside (for me) is that this will mean a significantly longer book and longer writing period. But I have a few cool plans for if I’m able to make myself finish it. For one thing, I want to commission Dyson do redraw the map of Gatlia and make it not terrible so that it can be included in the book. I don’t know what I’ll do about a cover; I got really lucky with the first one, but Selfpubcovers.com is much better for sci-fi than it is for fantasy insofar as covers without ladies on them. Not that there’s anything wrong with covers with ladies on them, but this particular story is not starring a lady. Nor is it starring a ripped shirtless dude. No, this book stars a young man from the village of Altier in the Barony of Nortune; orphaned by circumstance, he has decided that with the final harvest in, his parents affairs settled and the festival of Goash looming, he will leave his home and try to find some way to devote his life to stamping out the banditry on the rise in Gatlia which cost his father his life. Epic stuff? I hope it’ll turn out that way! Proud as I am of City at the Top of the World, there was plenty of naval gazing. After that, I’ve got two more books in the Cirsova setting planned out (more or less). Maybe I’ll have enough money to get Susan Van Camp or Rebecca Guay to make me a cover by then? *: It’s only been a little over a week and 80 eBook versions have been given away, however, so that’s a start! Tomorrow is the last day to download your Amazon Kindle copy of City at the Top of the World for free. Over 50 copies have been given away so far. It’s peaked at #48 in free Sci-if/Fantasy short reads. If you’ve downloaded it and liked it, review it! Gimme a star(or five. Preferably 5)!